Sleep apnea is a disorder in which a child will stop breathing while sleeping. It is common, and should be taken seriously by parents. The airway of a child who is afflicted with this condition will become blocked, which reduces the amount of air that reaches their lungs. Once this occurs the child may snore profusely as a result of straining to breathe. Their body and brain will be deprived of oxygen, which will wake them up. This cycle can repeat itself a few times each night, or dozens of times depending on the severity of the condition. CPAP, which stands for continuous positive airway pressure, is the primary treatment used for sleep apnea. CPAP keeps the airways of the child open while they sleep by providing a steady stream of air via a mask. This will prevent the pauses in breathing which accompany sleep apnea, and the child will rest without snoring or making choking sounds. CPAP equipment will consist of a machine that comes with a mask and tube. Most of these devices are small, about the same size as a tissue box. They are also lightweight and quiet, which means they can be used with ease. Parents will want to place the equipment on the nightstand next to the child’s bed. The tube attaches the machine to the mask, and is long enough to ensure the child can move their head and turn over without interference. Some masks cover only the nose while others cover both the nose and mouth. The mask purchased for the child should be snug and comfortable. What are the benefits of CPAP? What are the risks associated with CPAP? There are few complications associated with this treatment, as it is non-invasive. However, when using CPAP children may complain of a sore throat or nasal dryness. This can be resolved by placing a humidifier into the child’s room so that moisture is added to the air. 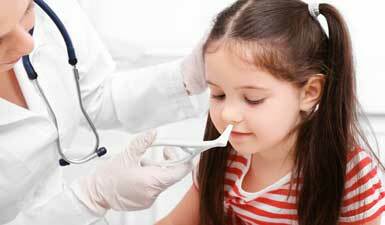 The child may also begin sneezing frequently, or their nose may become congested or runny. These side effects can be managed by providing a saline nose spray which will eliminate the congestion, and in severe cases, Dr. Samadi can provide a decongestant. What does the post-care entail? Once a diagnosis has been made for sleep apnea, the parents can purchase the necessary CPAP equipment and then begin using it at home with their child, until the condition is eliminated. The staff at ENT for Children will be happy to recommend the best CPAP products available, as well as the best ways for using them. Parents who have any questions about this therapy should contact us at their convenience.